This 9mm Luger ammunition from Federal makes a highly cost-efficient range load for those who enjoy shooting suppressed or use 147 grain carry ammo. 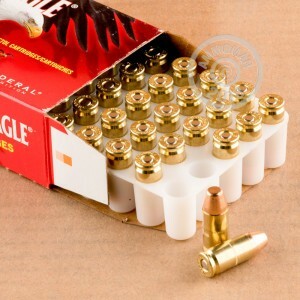 Each cartridge in this box of 50 fires a heavy 147 grain full metal jacket bullet at a subsonic muzzle velocity of around 1,000 feet per second. Although it has achieved great popularity among civilian shooters only in the last few decades, the 9mm Luger is actually one of the oldest pistol cartridges still in widespread use. Designed in 1901 as the 9x19mm Parabellum but commonly known (both officially and unofficially) by the name of its creator, Georg Luger, it was used extensively by the Axis Powers during both world wars and adopted by NATO afterwards. Its popularity took off dramatically in the US from the 1980s onward with the widespread adoption of semiautomatic pistols by police departments. Pistols chambered for the 9mm are extremely popular among concealed carry licensees and other gun owners as well due to their balanced handling and low cost of operation. 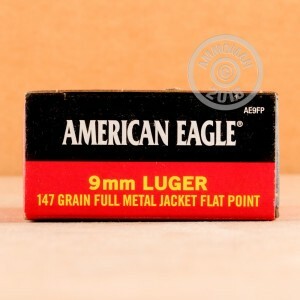 Stock up on inexpensive 9mm ammunition for your next few shooting trips at AmmoMan.com, where all orders over $99 ship for free!